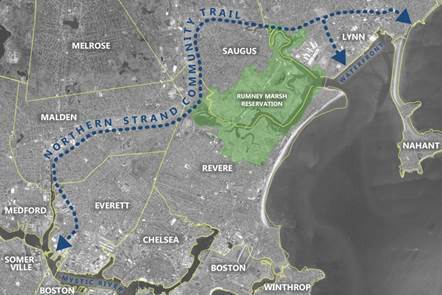 Another Round of Trail Design Meetings Set For November – Bike to the Sea, Inc.
A second round of public meetings on design work for the Northern Strand Community Trail are scheduled in Malden, Everett, Revere, and Saugus. Malden: Monday, Nov. 5, 6 p.m., in the Malden Senior Center cafeteria, 7 Washington Street in Malden, Mass. Saugus: Wednesday, Nov. 7, 6:30 p.m., in the Saugus Town Hall auditorium, 298 Central Street, Saugus, Mass. Revere: Tuesday, Jan. 8, 6 p.m., Revere Society for Cultural and Historic Preservation, 108 Beach Street, Revere Mass. Everett: Tuesday, Nov. 20, 6:30 p.m., at City Hall, 484 Broadway, Everett, Mass. Lynn: Wednesday, Nov 28, 6:30 p.m., Lynn City Hall, 3 City Hall Square, Lynn, Mass. The first round of public meetings on design work for the Northern Strand Community Trail were held in the spring.